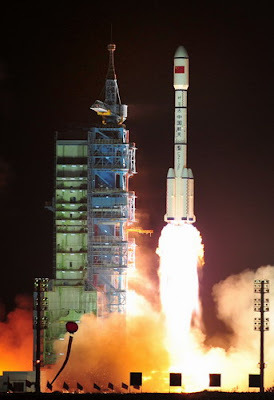 JIUQUAN: China successfully launched an experimental craft on Thursday paving the way for its first space station amid a blaze of national pride, bringing the growing Asian power closer to matching the United States and Russia with a long-term manned outpost in space. The Tiangong 1, or "Heavenly Palace," blasted off from a remote site in the Gobi Desert at 9:16 pm (1316 GMT), adding a high-tech sheen to China's National Day celebrations on October 1. Premier Wen Jiabao watched as the small, unmanned "space lab" and the Long March rocket that heaved it skyward from a pad at Jiuquan in northwest Gansu province, lifted off under clear skies, in images shown live on state television. It is the latest show of China's growing prowess in space, and comes while budget restraints and shifting priorities have held back U.S. manned space launches. "Its name ... speaks for a dream home the Chinese have long envisioned in the sky. In Chinese folklore, a heavenly palace often refers to the place in outer space where deities reside," the official Xinhua news agency said.The big test comes weeks after its launch, when the eight tonne craft attempts to join up with an unmanned Shenzhou 8 spacecraft that China plans to launch. Space docking tests conducted with the Tiangong 1 will provide experience for the building of a permanent manned space station around 2020, mission spokeswoman Wu Ping said. China's government will hope to set a successful Tiangong mission alongside other trophies of its growing technological prowess, including the launch of a trial aircraft carrier.And the launch, just before China's National Day holiday, was accompanied by an outpouring of proud support for the country's technological achievements. "I feel great pride in being Chinese today. This is another great step forward for China in space," wrote Shi Zhongshan on the popular Twitter-like microblogging site Sina Weibo. this week more than 200 people were injured when two subway trains ran into each other in Shanghai. "I'd prefer more attention be paid to the high-speed train and Shanghai subway crashes than to Tiangong 1. The later is related to face, but the former is to do with our lives," wrote "Weixiao Xiaoran," also on Weibo. Engineers had been watching launch preparations nervously, after another Long March rocket malfunctioned and failed to send an experimental satellite into orbit last month. Beijing is still far from catching up with space superpowers. The Tiangong launch is a trial step in Beijing's plans to eventually establish its own space station.Russia, the United States and other countries jointly operate the International Space Station, to which China does not belong. But the United States will not test a new rocket to take people into space until 2017, and Russia has said manned missions are no longer a priority for its space program, which has struggled with delays and glitches. Earlier this month, NASA unveiled plans for a deep-space rocket to carry astronauts to the moon and Mars. President Barack Obama has called for a human expedition to an asteroid by 2025 and a journey to Mars in the 2030s. China launched its second moon orbiter last year after it became only the third country to send its astronauts walking in space outside their orbiting craft in 2008.It plans an unmanned moon landing and deployment of a moon rover in 2012, and the retrieval of lunar soil and stone samples around 2017. Scientists have talked about the possibility of sending a man to the moon after 2020. China is also jostling with neighbors Japan and India for a bigger presence in space, but its plans have faced international wariness. Beijing says its aims are peaceful, and military involvement natural given the enormity of the undertaking.